I really enjoyed the Betty Rocker Challenge for this past month. The exercises are all body weight exercises that she sends you each week. There are seven exercises and you do three rounds of the seven exercises. It takes approximately 30 to 35 minutes to complete a full three rounds for me. I thought this final week, week 4, was the most challenging and had a lot of hard exercises compared to the other weeks. One of my favorite exercises from this week was called Sit Outs – seen in the lower left photo. It was tough but a great core workout. I would challenge myself to see how many I could complete in a minute – I think the most I got up to was 32. Typically I could do 30 in a minute. I decided to go back to doing some of my workout dvd’s this past week. The previous two weeks I had been using some of my workout books instead of dvd’s. 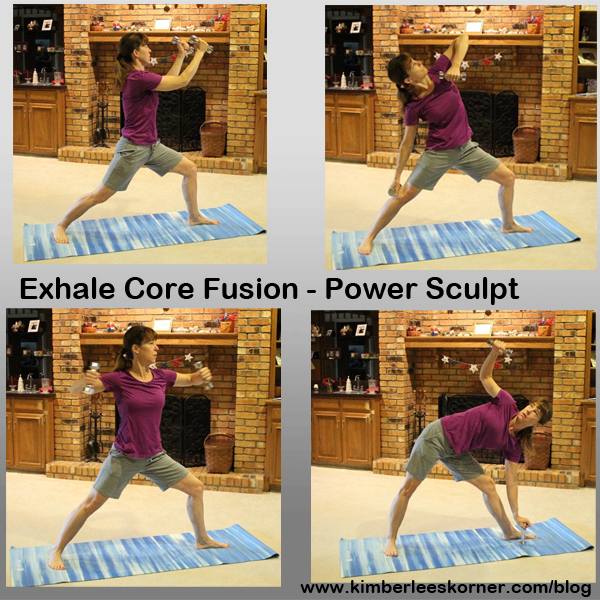 This week I used a few of my Exhale Core Fusion dvd’s. I love these workouts and I think I own all of the dvd’s in this series. They are done in your bare feet and are a combination of yoga and pilates moves. They really transform your body – especially the ab-core area – with some targeted moves that don’t look hard but when you try them you find out they are more challenging than they look. They also have great exercises for toning the arms and legs, too. Another thing that I really like about the Exhale Core Fusion dvd’s, and I think I mentioned this before in a previous fitness post, is that the workouts are divided into 10 minute segments and you can choose which ones you want to do. There are typically five or six 10 minute segments on each dvd. I usually pick three or sometimes four so I do a 30 or 40 minute workout. Today I did a little bike riding through the neighborhood on a route I like to take that I mapped out a couple of years ago. It takes me about 20 to 25 minutes to complete the route and then I come home and stretch a little while waiting for my coffee to brew. It was nice to be out early this morning and enjoy a peaceful bike ride. I saw a half a dozen or so people walking and it was nice to say Good Morning as I rode by. I am definitely ready to start incorporating more bike riding in my fitness routine. I have been riding my bike to the store some but have not been doing my regular biking in the mornings like I did last summer. It is time to start that again and enjoy being outside in the fresh morning air. I have also been able to enjoy making salads with some fresh romaine lettuce from our garden a couple of times this past week. I have not been too successful in the past with growing lettuce but this year it has done pretty good. It is nice to eat something that you have been able to grow yourself. What was your workout routine for the week? Click on Leave A Reply to let me know about it. Recently I have made a couple of new skirts. After my jeans sewing marathon I switched to making skirts. I love sewing skirts because they are easy and fun to make and go together very quickly, in my opinion. They are also comfortable and fun to wear – especially in the spring and summer months. Sometimes I think wearing a skirt is actually a lot cooler than wearing shorts in the hot Texas climate I live in. Last week I wore a skirt four days out of seven. My husband refers to it as being “dressed up” but I look at it as being cool and comfortably dressed and ready to go somewhere if the occasion arises. 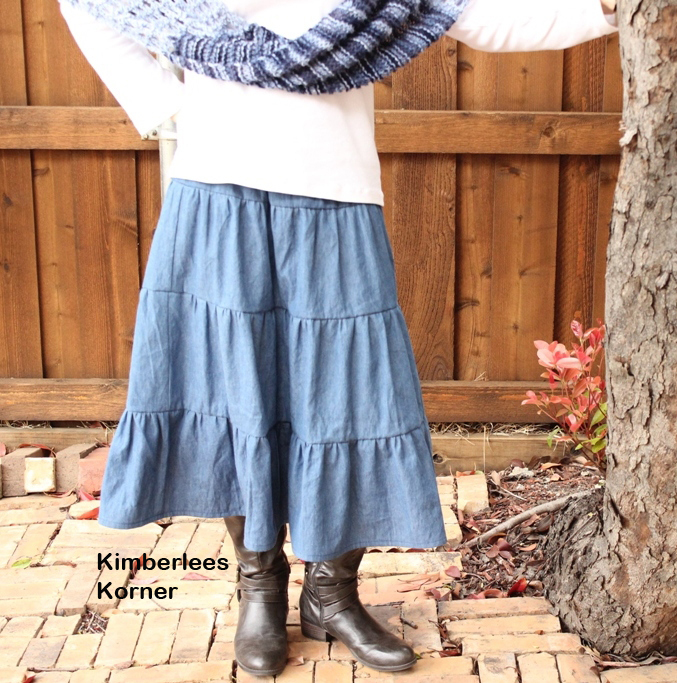 The long tiered skirt above is made from a lightweight denim that I bought at Joann a while ago. I actually finished this one right before Easter weekend and was able to wear it to church with my Nymphalidea Shawl that I knitted and did a post about back in April. I love this skirt and have so many things that it goes with since I love the color blue. It is really comfortable to wear and looks great with boots or sandals. 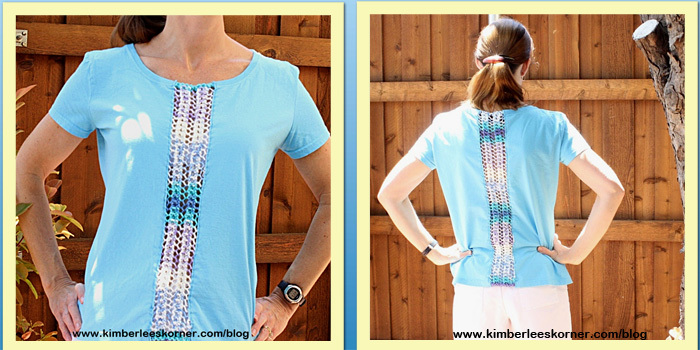 The pattern I used to make this was New Look 6565 and it is super easy. I think it takes longer to cut out the pieces you need than to actually sew it. 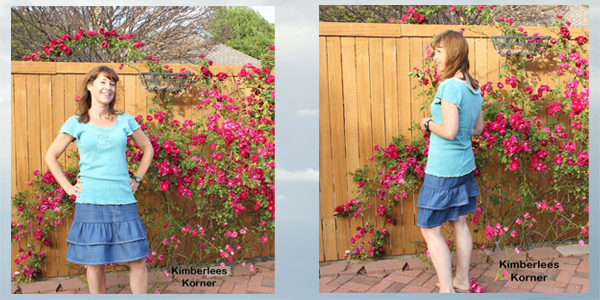 The short denim skirt in the above photo is made using the same New Look pattern, 6565. I just finished sewing this skirt a couple of weeks ago and have worn it a couple of times. I did some stitching detail with a white thread and a zigzag stitch for the lower hems but it is hard to see. These photos were a challenge to get since it was so windy that day – actually that whole week was windy. I really wanted to get a photo with my roses in the background, though. The black skirt above was sewn using the same version of the pattern as the long denim one. I made this one back in the fall and have worn it a lot since then. For this skirt I used a lightweight broadcloth fabric and I like how easy it is to wear and wash – no wrinkles other than the gathered areas which is fine and the look I want. These skirts are really simple to make as long as you are familiar with how to gather fabric. Below is a little step by step photo on the process I use to gather – it is the old school way and it works just fine every time for me. To make these skirts you really just need a regular sewing machine but I would recommend finishing off all of your seams with a zigzag stitch or some type of overcast stitch your machine might have so that the seams do not fray. I have a serger so I serged all of my seams. If you have a sewing machine and a couple of hours time you can make this type of skirt. What sewing projects are you currently working on? (or any type of projects) I usually have a sewing project, knitting project and a crochet project going at all times. That way if I get bored or frustrated with one thing I can go to another. Another week has come and gone. The past two weeks have gone by really fast for me for some reason. Maybe it is all the end of the year activities with my kids and their schools or something. 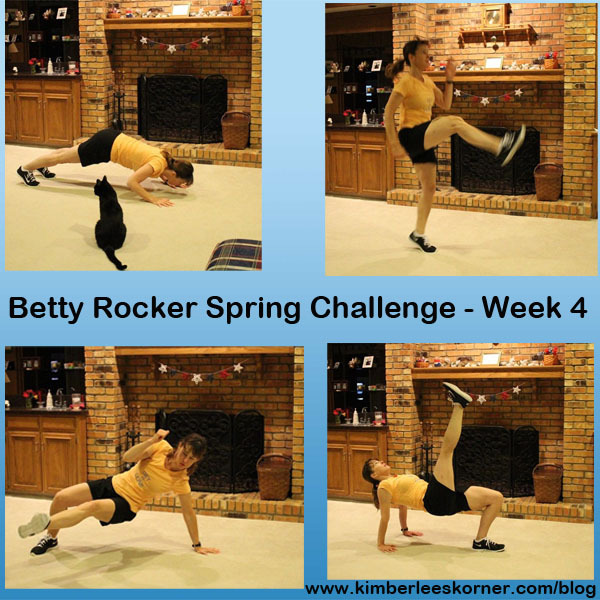 This week was week 3 and the beginning of week 4 of the Betty Rocker Spring Challenge and I also decided to use another one of my exercise books on the days I was not doing the Betty Rocker workouts. 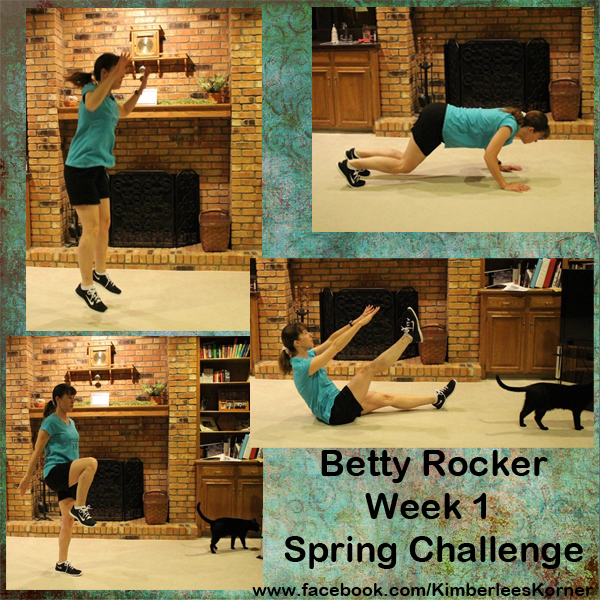 The Betty Rocker workouts were tough body weight workouts this past week. I actually thought week 3 was a little easier than week 2 – but not much. I really liked the Hindu Push Ups – (top left photo) and the Grasshoppers (lower right photo). As you can see I had my personal trainer monitoring my moves once again. He has a new scarf on for the Memorial Day holiday – it is red with baseballs on the fabric. My kids thought he needed a new scarf. He has now learned how to remove it so he is constantly taking it off and we find it various places around the house. This past week I choose once again to use one of my workout books that I own instead of my dvd’s. The one I used this time was CORE by Hollis Lance Liebman. I got this book last summer from Half Price Books. I used it quite a bit last summer and really like the routines in the book. 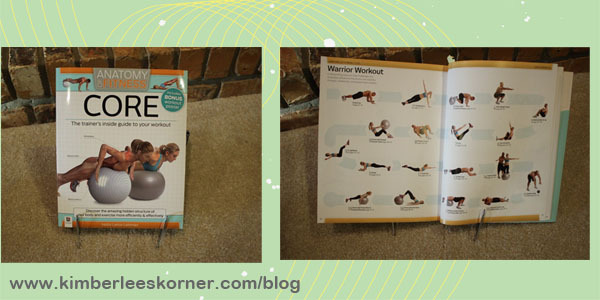 The photos in the book are all color and each exercise is explained in detail along with photos. The back of the book contains various routines that are anywhere from 8 to 20 exercises per routine. You can see the book and one of the routines in the above photos. 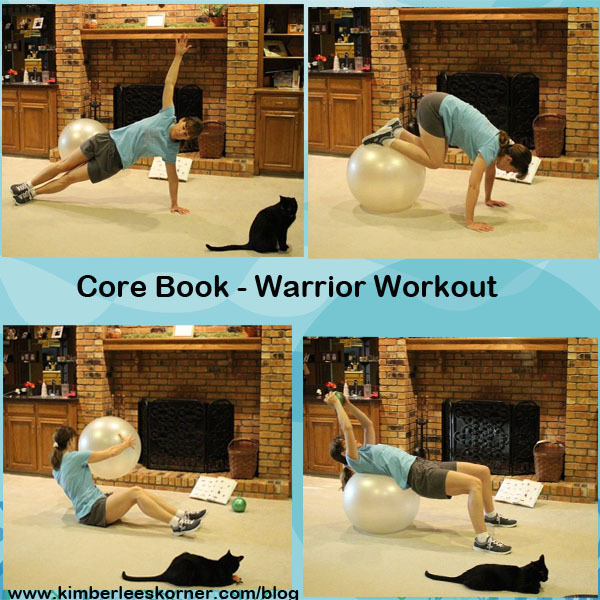 All of the exercises concentrate on the core and use either no equipment, an exercise ball, medicine ball and some dumbbells for a few exercises. I also really like how each of the exercises lists the areas of your body it benefits and what areas it is working and it gives you a skill level like beginner, intermediate or advanced. Once again my cat is present to make sure I am doing everything correctly. I also decided to start drinking my green drinks and smoothies again. The one I made this week and drank a few times for lunch was a recipe I found in my Ninja blender book. I actually changed a few things in the recipe like the ginger and the amount of agave or honey. They said to use fresh ginger and I only had some crystallized and I added less agave than what it called for. I think their recipe said 1 to 2 tablespoons of agave or honey and I only use 1 or 2 teaspoons to cut back on the sugar as the crystallized ginger also has sugar in it. I did a green smoothie challenge back in January of 2014 where I drank one per day for the whole month. I think I have only made a few since then. I think one of the reasons is it was cold out (winter time) and I don’t care for really cold drinks in the winter. I forgot how great drinking these juices or smoothies can make you feel and look. I will say they are kind of an acquired taste but once you get past the look of it and realize the health benefits it is worth the effort to make it and drink it regularly. I plan to make it a goal to have at least three per week. 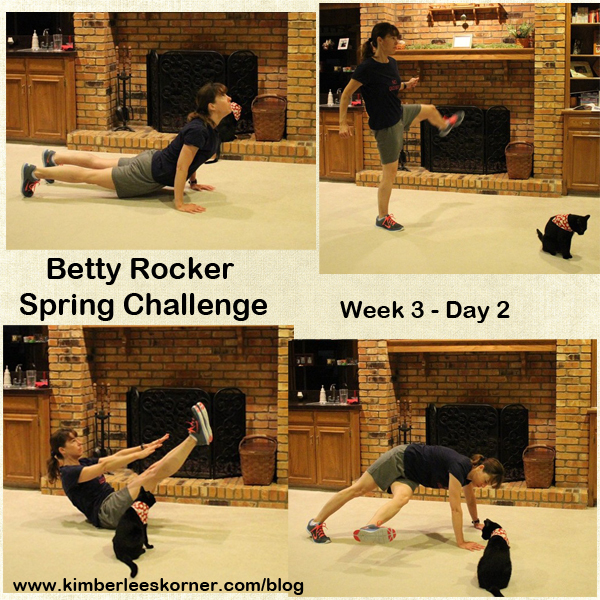 Next week I will be finishing up the Betty Rocker Challenge with week 4. I have not decide yet if I will be using another workout book or go back to some yoga dvd’s in between the BR workouts. What workouts are you currently doing? I would love to hear about them – click on Leave a Reply to let me know. 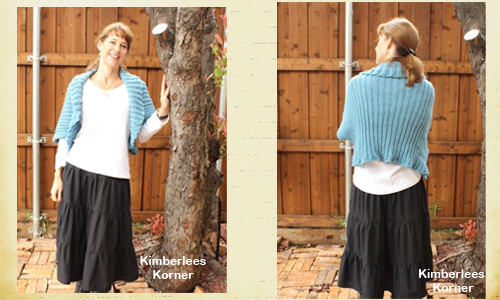 I participated in another KAL (Knit Along) for May with my facebook knitting group. 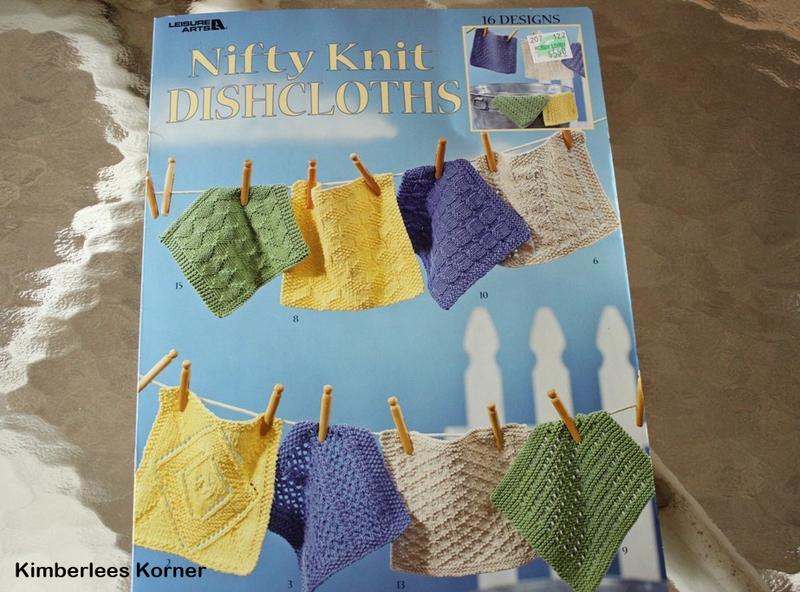 This month the project was for knit dishcloths. I have knit one or two in the past and also crocheted a few but never really got into making them. Well, that all changed this month because I have been cranking out these dishcloths regularly for the last two weeks. Let me tell you they become addictive to make and are so much fun. I really like the fact that they can be knitted in a day or two and you feel like you have accomplished something that is useful. Another fun (and addictive) thing about knitting these dishcloths is going to the store to pick out the yarn. I made all of mine with the LIly Sugar and Cream yarn. There are so many fun colors, prints, stripes and ombres to choose from at Hobby Lobby and Michaels. So, I now have a new stash of the cotton yarn for dishcloths. Below are some photos of the dishcloths I recently made. I am also including the pattern link to some of them as there are tons of free patterns all over the internet and on Ravelry for dishcloths. 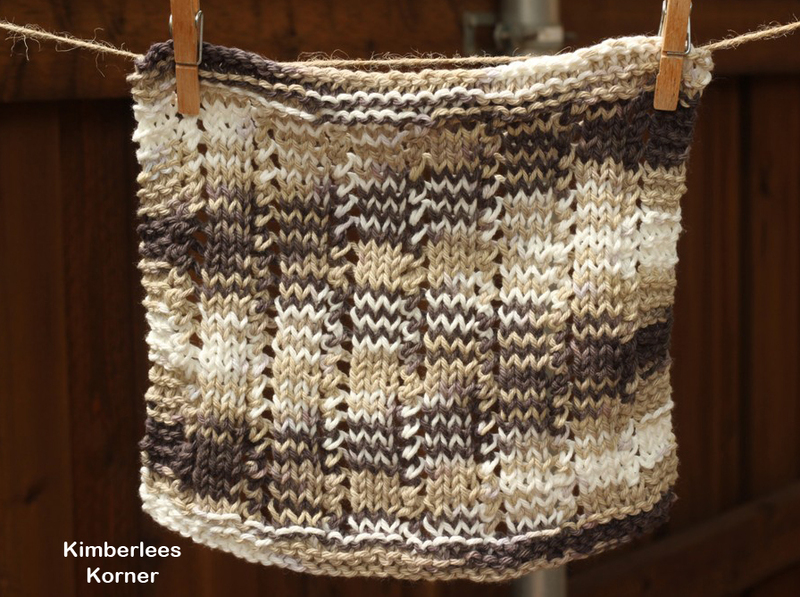 The one above is the Waffle Knit Dishcloth <click on link for the free pattern. This is another one of my favorites and I really like the yarn I knit this one with which I think was called natural stripe. This one I knit on a size 7 needle and with 40 stitches. I really like the size of this one, too. The two in the top photo I sent to my mother-in-law as I thought the colors would go with her kitchen and she likes green. The bottom one in the browns and tans I kept for our kitchen as my counters are kind of that color. 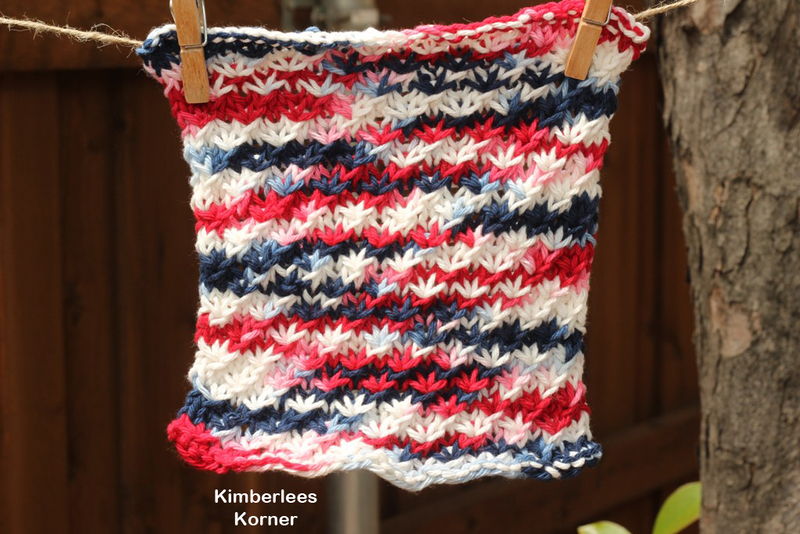 I really like this little red, white and blue one and knitted it in a star stitch pattern. 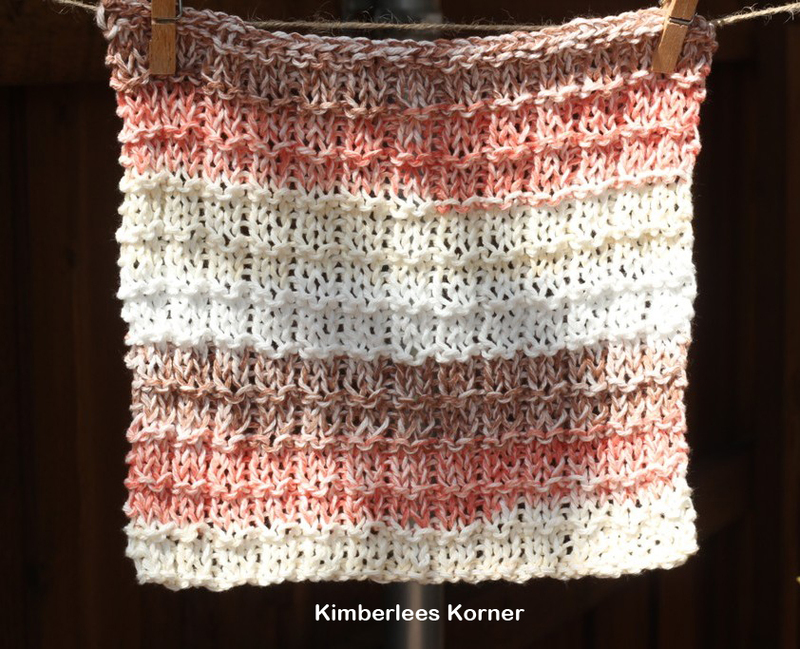 It is another free pattern I found on Ravelry – Star Stitch Dishcloth. This one is a little small – only about 7 by 7 inches but I like it. I got it done in time to use for Memorial Day weekend so I am saving it for that. 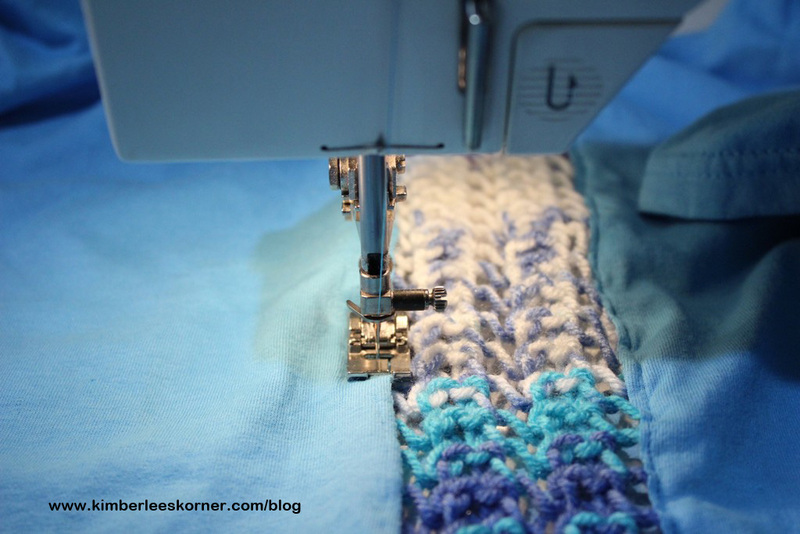 The pattern is a 4 row repeat and very easy to do. 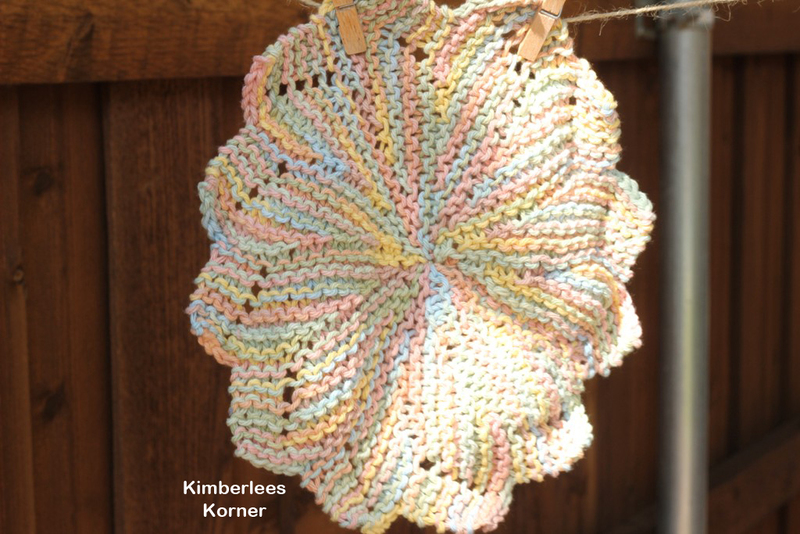 The pattern above was for a flower type of design called the Almost Lost Dishcloth Pattern. You can click on the highlighted text for the pattern from the Simply Notable blog. It was a lot of fun to knit and very simple, too. I made this one in a day. I decided to use it as a table decoration under my flower arrangement for now. Maybe after Memorial Day and the 4th of July I will use it as a dishcloth. 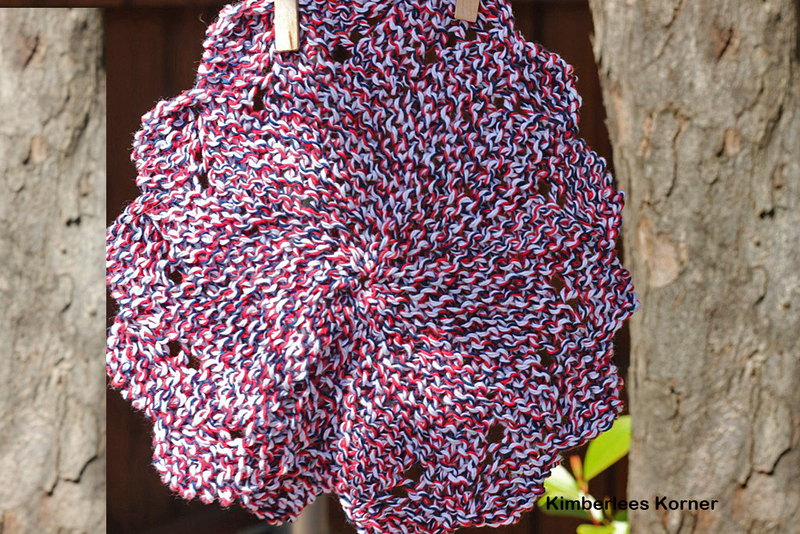 This one was knit in the Lily patriotic print cotton yarn which I found at Michaels. This other flower dishcloth was called the Petal Dishcloth. It was very similar to the Almost Lost pattern but with a few extra stitches so it is a little bigger. 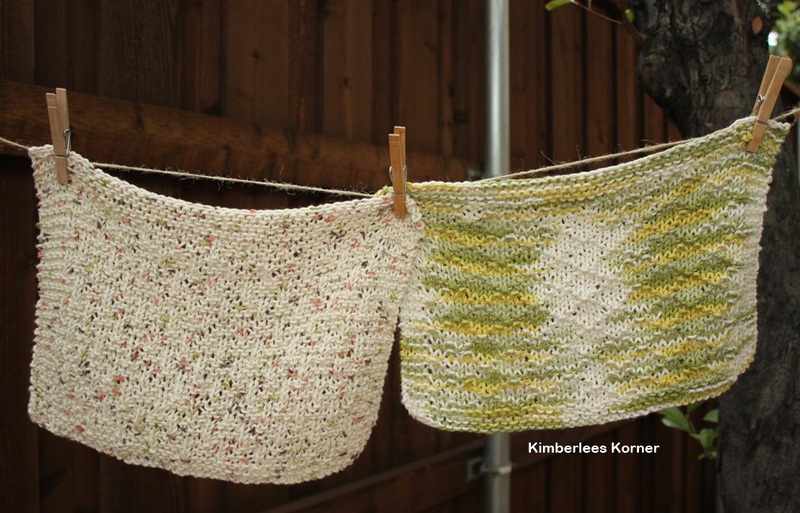 It is fun to use a flower shaped dishcloth versus the traditional square one. I am enjoying knitting, and using, all my new dishcloth designs. These dishcloths are also great for an on the go project since they are small they are easy to take with you and take out and work on if you have to wait somewhere. They also make great gifts and I plan to knit more up and set them aside to have some available to give away. One thing I have noticed with them though is that they work a lot better after they have been washed a couple of times. They kind of need to be broken in and then they wipe off your counters and wring out better. What projects are you currently working on? I have started another project for a shawlette for an Art Yarns KAL. I had wanted to start it sooner but the yarn I ordered for it was on back order and I just got it a couple of days ago. I will be sharing that in June when I get it finished. Well, I usually try and get my weekly workout post done on Saturday. 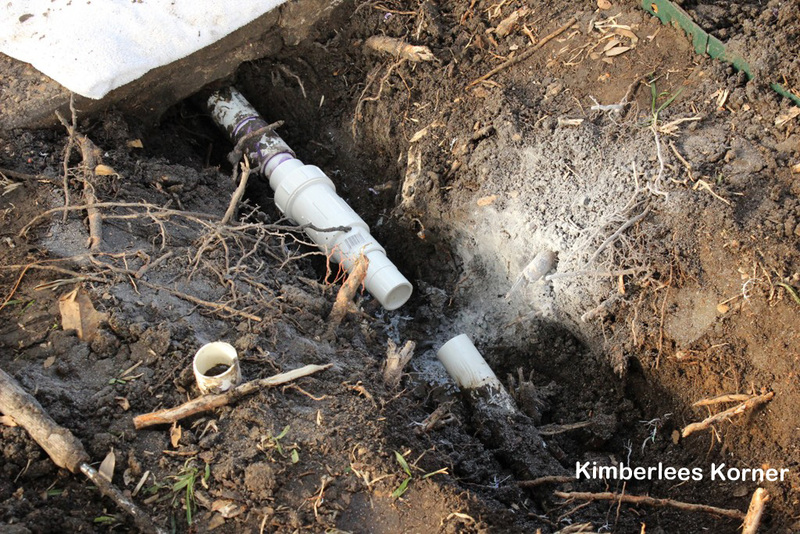 I am a day late this week because of a pipe fiasco that occurred yesterday at our house. We had a little gardening to do out front of our house and I went out there around noon to help my husband till up the front flower beds and add in some new dirt. I figured this would take a couple of hours and then I would come in and do my blog post. Well, I was out there for about six hours instead. You see – right after I got out there my husband was digging and chopping through some roots from our big Magnolia tree that he thought were causing our front walkway to crack (which they are). In the process of doing this he hit a pipe that goes to our outdoor sprinkler system and it cracked and started shooting water everywhere. So, off goes the water for many hours and lots of digging and trips to Home Depot (like 3 or 4) to fix this problem. Thankfully my husband is handy and can figure these things out and fix them himself – although I am sure that is not how he planned to spend the entire Saturday afternoon. There was a point in time, around the third trip and at about 4pm, that he said he may have to call someone – but with some more hard work, a few prayers from me and another trip to the Home Depot he got it repaired and our water was back on. I was able to finish the garden work while he dealt with the problem and made multiple trips to the store. We have a rain barrel and I was able to use water from that to get my flowers planted. 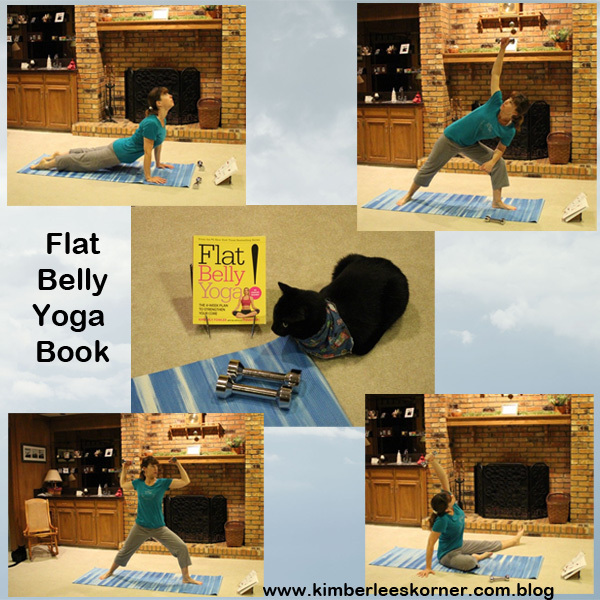 I really like the Flat Belly Yoga book by Kimberly Fowler. So does my cat as you can see. He is all dressed up in a scarf my sons have decided he needs to wear – I don’t think he really likes it that well but puts up with it. This book is an excellent book, in my opinion. I got it back in the fall of 2013 and used it for a while then. I decided this week to get it out again. All of the routines concentrate on the core and most of the exercises use light hand weights of 2 or 3 pounds. The exercises are great for strengthening your stomach and back and really lengthen your whole body. All the exercises are explained well and it is an all color photo book with multiple photos of how to do one particular move. I like books like that. Betty Rocker week 2 and the beginning of week 3 challenge was a “challenge” for sure! There is this skinny sumo move in week 2 that I could hardly get through all of those for one minute. One minute of doing one particular move does not sound hard until you actually try it. I really like how this challenge is all body weight exercises and requires no equipment. I like using my weights, step and other things but sometimes it is a nice change of pace to not have a lot of things to lug out and put away. I also tried a new healthy muffin recipe this week from Pink Recipe Box. The recipe is for Healthy Double Chocolate Oat Bran Muffins. They were really good – made with oat bran and some whole wheat flour so they have lots of fiber. My oldest son liked them, too. I also took my friend Karen one when we met on Friday at Starbucks to knit and have coffee and she liked them as well. I will probably make them again this week. You can click on the highlighted link and it will take you to the recipe for them. I hope everyone had a great week and you are able to get in some fitness time for yourself. I would love to hear about your workouts – you can click on Leave a Reply and tell me about them. This shawl is a project I recently designed and made for my mom for Mother’s Day. I began working on this shawl the end of April after finishing my shawl from the KAL I did with my facebook knitting group. I had to knit fast as my mom does not live near me and the gift needed to be mailed. I knitted this shawl on size US 6 knitting needles. Now anyone who is a knitter knows that projects on size 6 needles do not knit up as quickly as say something on a size 10 needle – so the weekend before Mother’s Day if I was sitting I was knitting, as the saying goes. Luckily the weather was nice that weekend and I could sit outdoors on our patio to knit. 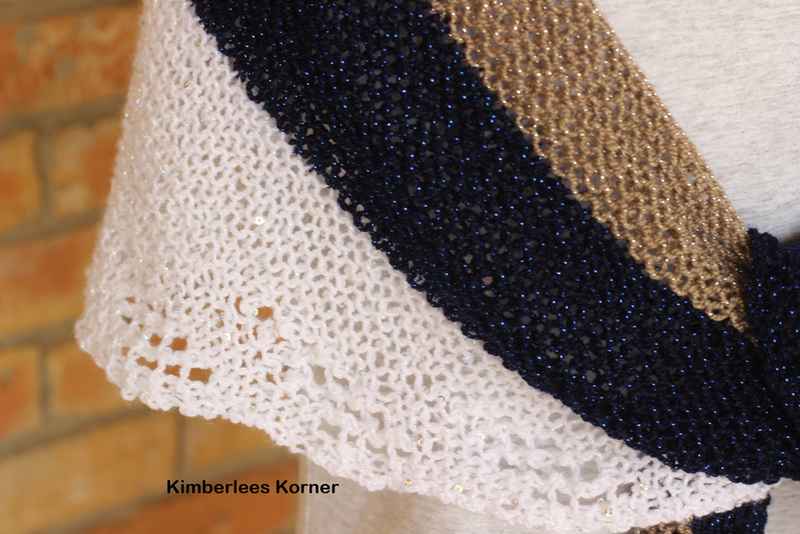 The yarn I used was a combination of glittery and sequin yarns that I had in my stash. I didn’t have enough of one skein to do the whole thing the same color so that is where the idea came in to do a color block type of shawl. 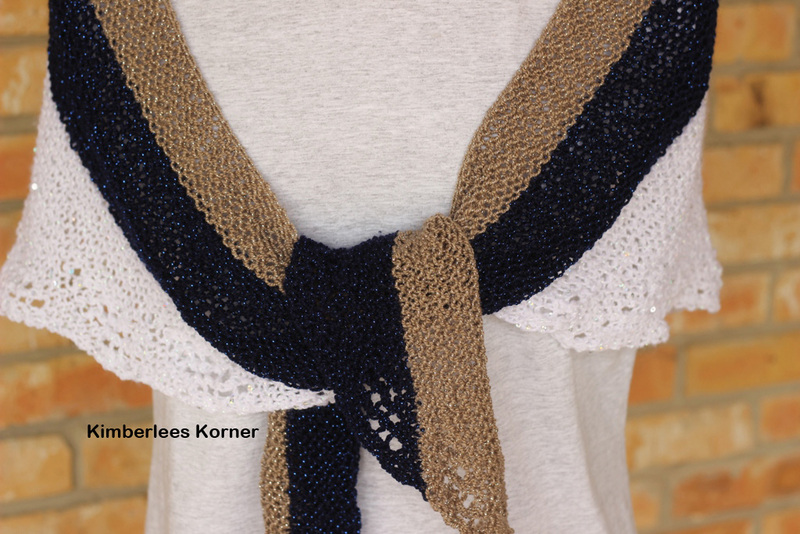 The yarns I used were Vanna Glamour in the navy and beige and the white was Payette from Loops and Threads, which I believe is the Michaels label of yarn. One skein of each color yarn was used. The edge of the shawl features a short row shaping and a lacy stitch which produces a gentle scallop or wave. I really like how that turned out and looks in the front when it is tied. My mom called me on Monday to tell me she got the shawl. There is a funny story about me finishing it frantically and mailing it Priority last Wednesday so it would get there by Saturday. I get a phone call from her last Friday, the one before Mother’s Day, and they are on their way to go visit my grandmother, who is 91 years old, for the weekend. I knew they would be going to see her for Mother’s Day but thought they would not leave until Saturday and she would have gotten the package by then. I told her that I made an exerted effort to get it to her and we just laughed about it. I had already kind of warned her the week before that her gift might be a couple of days late. Well, anyhow – she received it by Monday when they got back home and she loves it. I am so glad – I knew she would like the colors and would have lots of things to wear it with. I went to Michaels yesterday to get some cotton yarn for the new KAL I am currently doing with my facebook knitting group that is knitting various dishcloths – the goal is two per week. Well, while I was there I found this pretty yarn on clearance for only $1.79. It is from Patons and called Glam stripe. There were a couple of other colors but I just got these 4. 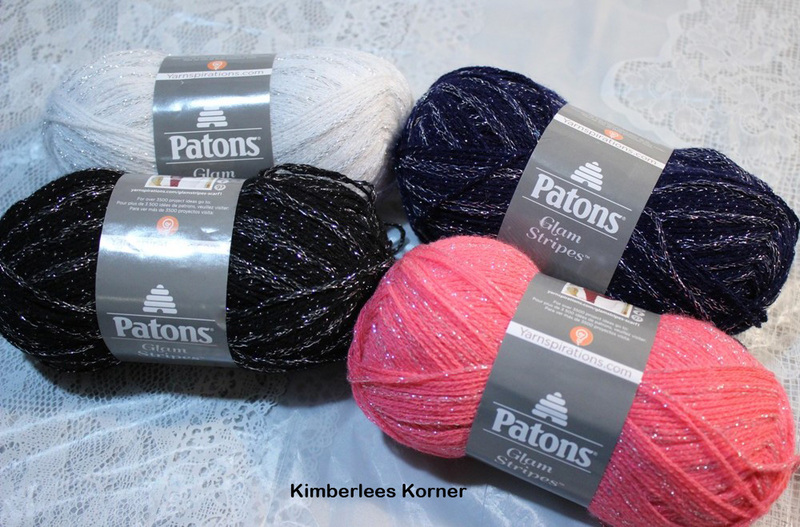 I am going to be making another shawl using my Garter and Lace Wave pattern and combining it with some of this yarn and other sequin and glitter yarns in my stash. 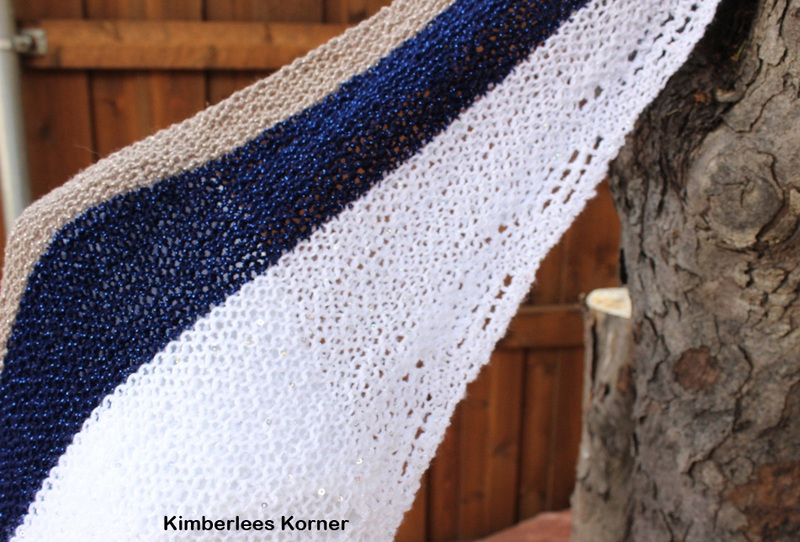 The pattern for this shawl will be available in late May or early June in my etsy shop. What types of projects are you currently working on? Click on Leave a Reply and tell me about them. Last Saturday I was getting my sons’ bikes out and putting air in their tires and decided it was time to start riding my bike again and use it to go to the store to get some groceries. I usually try and do this every Spring and Summer as it is a great way to get some exercise and be outdoors and it saves on gas, too. There is a Walmart that I ride to that is about a mile away and they have a bike rack for me to lock my bike up. I really enjoy riding to the store. It also kind of limits what you can buy so you only buy what is necessary and not all those extra things that tend to catch your eye. I can usually get three bags of groceries – large bags that I made myself from fabric – on my bike. The Betty Rocker Challenge was a pretty good “challenge” this past week. All the exercises are body weight exercises. There are 7 exercises that you do for one minute each and repeat them three times. I definitely worked up a sweat every day I did those exercises. My faithful workout friend was usually present to supervise me (my cat). 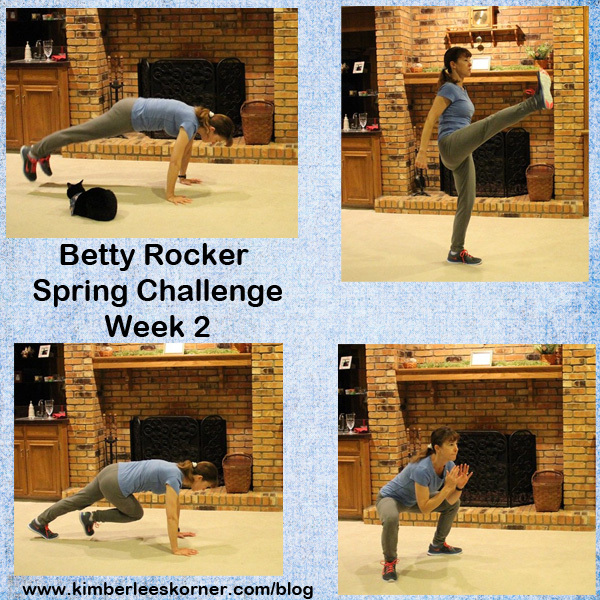 Week 2 of the Betty Rocker challenge began for me on Friday. The exercises were similar to last weeks but with some add ons to make them more challenging. They were definitely more challenging for me. Especially this one called skinny sumos – by the third round on those I had to slow down to make it through. 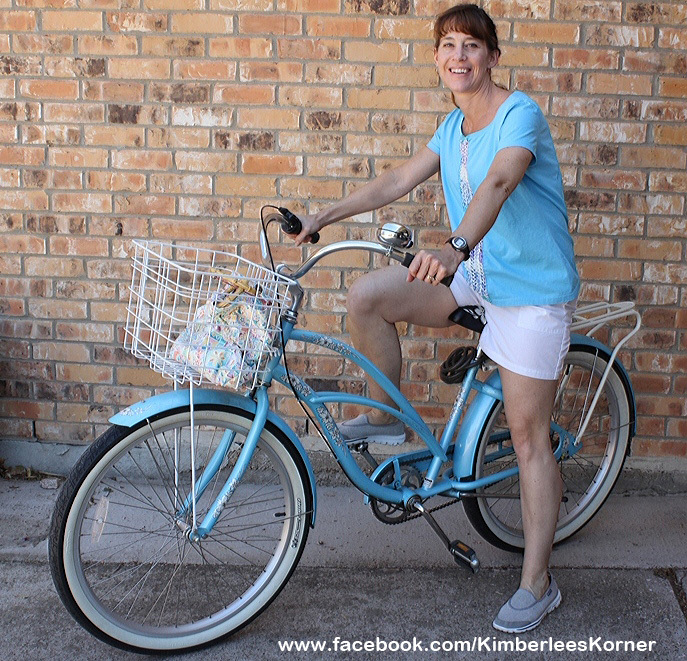 Quote from the Betty Rocker Challenge: “Fit is not a destination – it is a way of life.” I really like this quote as that is how I look at fitness – as part of my daily routine so therefore it is a part of my life. After a couple of the Betty Rocker workouts I did a foam roller stretch routine. I mentioned a month or two ago that I had gotten one of these. I really like it for lengthening and stretching out the muscles after a workout or even just in the evening while I watch a TV show. The quad stretch in the upper left photo is great and I also really like the upper back roll out in the upper right corner photo. The middle photo is a glute stretch – another good one. The yoga workouts I chose to do were really good ones. I didn’t realize it until after I did the Thursday session that both the Tuesday and Thursday routines were “heart” related sequences. On Tuesday is was the AM Energy Radiant Heart which is actually a bonus on this dvd as it is from the Radiant Heart dvd (one I do not own). Thursday the session from the More Daily Energy dvd was called Evolution Heart Flow. Both of these routines had some great heart opening poses and some good hip openers, too. I made a new smoothie this past week that I just kind of threw together in my Ninja blender. It was really good in my opinion. It is made with rhubarb and strawberries. 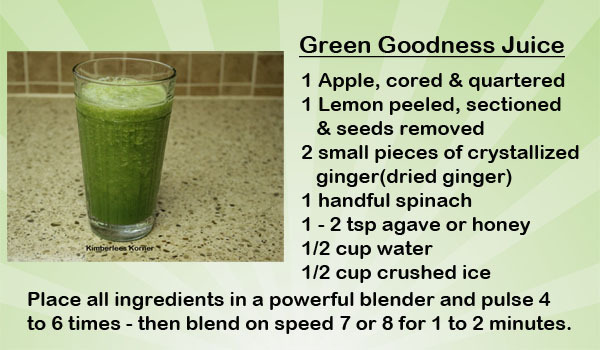 Place all the above ingredients in a high speed blender and blend 1 or 2 minutes until smooth. 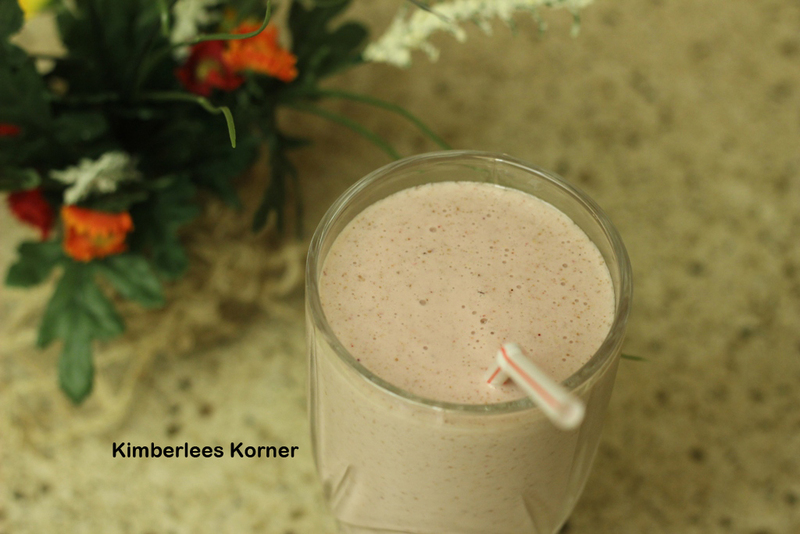 If you use both frozen rhubarb and strawberries this is almost like a strawberry milkshake. I really like how this smoothie tasted. It wasn’t too sweet and I love having the rhubarb in it. I guess if you wanted to sweeten it a little more you could add a spoonful of honey or agave to it. Rhubarb is really good for your digestive system as well as keeping your skin from premature aging. It is a good source of vitamin C, calcium, magnesium, potassium, oxalic acid and fiber. I have been buying it frozen from Kroger. It is one of the few places I was able to find it last summer. Let me know how your workouts are going by clicking on Leave a Reply. I hope everyone has a great weekend and a Happy Mother’s Day! This is another project where I have combined my love of sewing and knitting. I made my first top like this with a long sleeve shirt back in February. You can click on the highlighted text to take you to that project. Originally I had this project planned to share in March. Well, I actually had it done but did not like the end result with the particular lace panel of feather and fan stitch that I used. I like how it had the scallop in the front but the shirt seemed too loose. So, I ripped that out and started over. I went back to the knitting stitch I had used for my red top and just made it a little more narrow as this blue top seemed to be a bit more loose fitting than the red one. To make this you will need to know how to knit and how to use a sewing machine. Repeat row 1 for pattern knitting one panel for the front and one for the back according to how long those sections are. When panel is almost the measured length knit last row then bind off. Step 3: Pin knit panels to shirt with fabric on the top of the lace knit panel. Sew using a straight stitch and a stitch length of 2.5 – back stitch at beginning and end one or two times to lock stitches. Use the inner toe edge of your presser foot as a seam guide for fabric edge. Repeat this process a total of four times to attach panels to shirt. Step 4: Weave in tail ends of yarn and your top is done. Enjoy wearing it! I really like how this top turned out and have already wore mine a couple of times. I found out the other day as I went to ride my bike that it matched my bike so I took a picture. I have had this Electra 3 speed bicycle for about five years now. It was a combined Mothers Day and birthday gift. 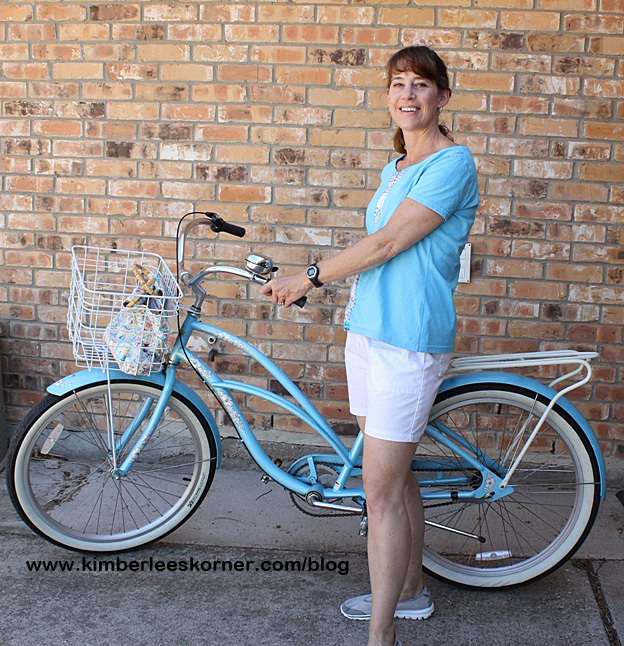 I love this bike and enjoy riding it around our neighborhood for exercise and to the store. I actually rode it to Walmart today to get a few groceries. It is hard to see but even the tire print has flowers for the treads. Now that gas is going up again I am planning on riding it to the store more frequently. 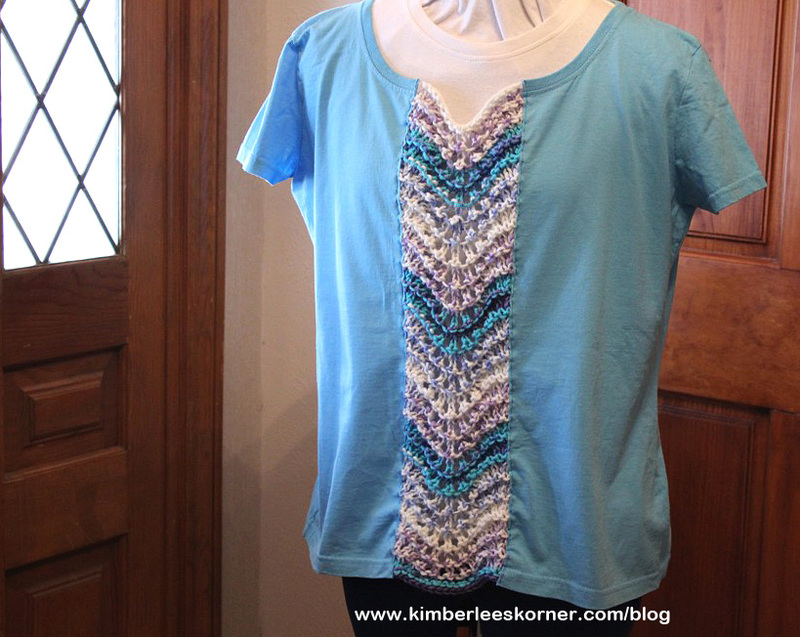 I hope you enjoyed this tutorial and have fun making a shirt if you decide to try it. It is really a very easy project and comes together quickly. Another week has flown by it seems. I can not believe it is Saturday already. 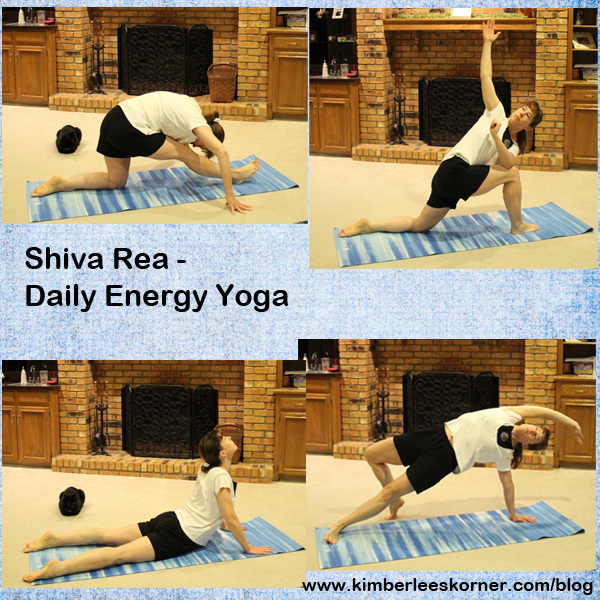 This past week I had my workouts scheduled to follow a rotation of Cathe Friedrich workouts and Shiva Rea yoga workouts. I had not done much yoga the past few weeks other than on Saturdays and I realized I was missing that so I added more in. I really enjoyed adding in more yoga to the week of workouts. When I was doing P90X3 you did yoga or pilates at least once a week or more and I definitely missed that. I think my cat missed yoga too – here he is supervising my session in a couple of the photos. 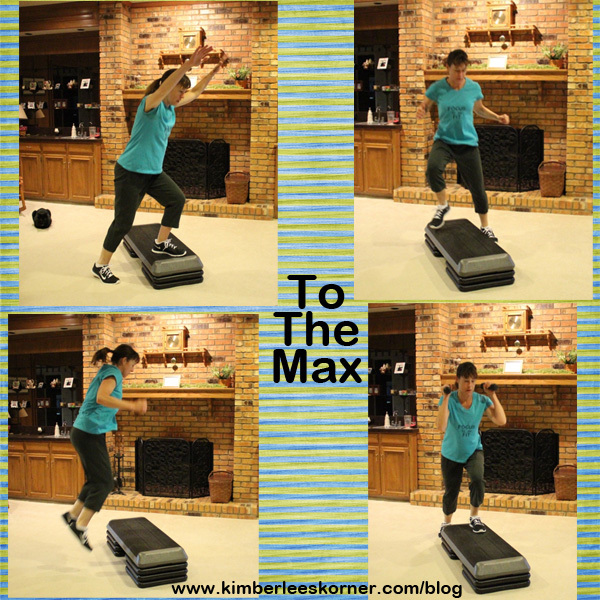 To The Max was a new Cathe workout for me. I believe it was actually released in 2012 but I just bought it a few weeks ago and had not tried it out yet. It is a very fast paced workout that uses the step at 2 and 3 risers high for much of the workout. 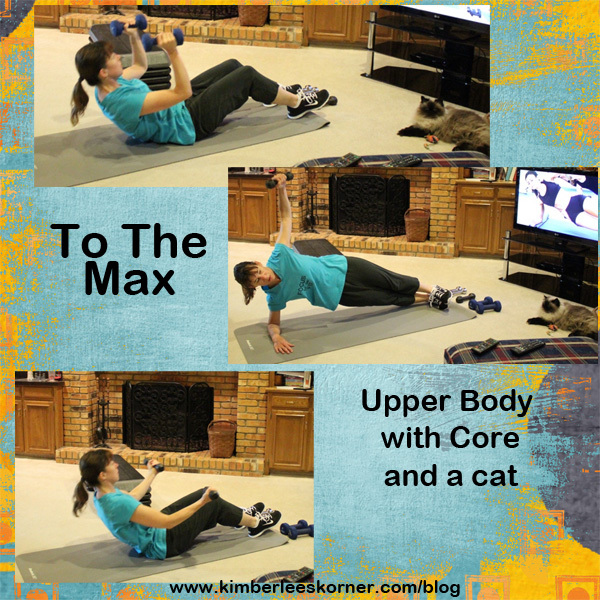 The end of the workout finishes with some creative core and upper body moves that I really liked – so did my other cat as she decided to sit and watch for that part with her fish toy by her side. As you will notice in my listed schedule there is a strike through for Thursday. That is because I decided in the middle of the week to do the Betty Rocker Spring fitness challenge after receiving an invite to join via email. I had done a previous challenge of hers that was the whole month of October and saw good results with getting much more lean so I have decided to do another one for the month of May. Therefore. starting next week I will probably alternate the Betty Rocker workout, which consists of 7 exercises that you do for one minute each for 3 rounds, and my Shiva Rea yoga dvd’s. So far I have only completed one session of the Betty Rocker exercises since it will run Thursday to Thursday. Also, after doing the workout on Thursday I started to get a tight and stressed feeling in my upper back between my shoulder blades. I am not sure if it was because of the push ups in the workout or maybe my form wasn’t right. I did stretch really good afterwards by doing my foam roller routine. I woke up Friday morning and wasn’t sure if I was going to be able to do my scheduled workout but I took some Advil and pushed play and once I got moving the pain subsided drastically. Thankfully it stayed away the rest of the day. I did wake up again today with a little bit of the same feeling but once I did my yoga I felt fine. 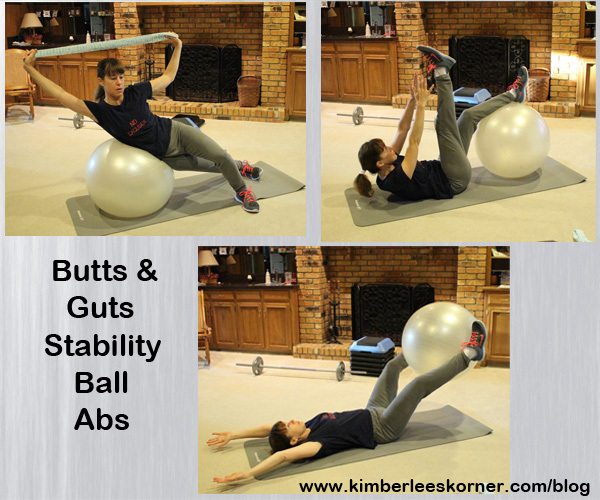 Part of my workout on Friday consisted of a stability ball ab routine that I really like – it is a bonus workout on the Butts and Guts dvd. I also got to use my crochet yoga strap in part of the routine. Well, I hope everyone has had a great week and you were able to get in some workout time for yourself. The weather is getting nicer here so I am able to be outside more and garden some and do some walking in the evenings with my husband.